Year-End Planning Under a Changing Tax Code. At Heritage Wealth Advisors, we consider tax planning to be a year-round endeavor that deserves constant, proactive attention. As the calendar rolls past Thanksgiving, it is natural to revisit the strategies we have been discussing with you. This year’s planning has been particularly interesting given the back drop of one of the most significant tax reforms since 1986. The Tax Cuts and Jobs Act (TCJA) was signed into law on December 22, 2017. The law included changes to individual and corporate tax rates, deductions for individuals and businesses, and the alternative minimum tax (AMT). While some of the same time-tested tax strategies such as deferring income and accelerating deductions still apply to many taxpayers, the new tax law has reshaped our approach to many of these techniques and increased the importance of planning over multiple tax years. This is especially true considering many of the new provisions will expire in 2026. As always, year-end tax planning does not occur in a vacuum and it is important to take account your specific purpose and financial goals. The Tax Cuts and Jobs Act lowered the top federal tax rate from 39.6% to 37% and expanded the threshold for several of the middle tax brackets. The result for the majority of taxpayers may be a lower individual marginal tax rate. Below is a table comparing the brackets from 2017 to 2018. It is important to note that while the brackets for capital gains rates did change, the rates themselves remain unchanged at 0%, 15% and 20%. The additional Medicare Surtax of 3.8% on unearned income and 0.9% on wages remains in effect for taxpayers with adjusted gross income in excess of $250,000 for married filers and $200,000 for single filers. Managing tax brackets is an important part of pro-active tax planning. In addition, taxpayers who are Medicare eligible may be able to reduce the cost of Medicare benefits by reducing their income. Income can be deferred by maximizing retirement plan contributions as well as contributions to Health Savings accounts (HSA’s) and employer sponsored flexible spending accounts (FSA’s). Recent market volatility may also provide an opportunity to harvest capital losses in taxable portfolios to offset previously recognized capital gains. We touched on loss harvesting in our November 2018 Portfolio Insights. While most of the focus is often on reducing income to manage tax brackets, other taxpayers may wish to accelerate income to take advantage of a lower bracket this year if they are likely to find themselves in a higher bracket in future years. One more note on the change in tax rates—keep an eye on withholding rates for wages and pension payments. The IRS updated withholding tables automatically in January 2018 in response to the TCJA and many of our clients have seen their withholding decrease as a result. We have been factoring the reduced withholding into calculations related to estimated payment requirements. Beginning in 2018, many taxpayers who previously itemized their deductions may find it is no longer beneficial when compared to the standard deduction. The TCJA increased the standard deduction from $12,700 to $24,000 for married filers and from $6,350 to $12,000 for single filers. In addition, taxpayers over the age of 65 or blind will receive an additional deduction of $1,300 per person for married filers and $1,600 for unmarried taxpayers. The increase in the standard deduction helps to partially offset the loss of the personal exemption deduction and other miscellaneous itemized deductions such as investment expenses, professional dues, safe deposit box fees, tax prep fees, etc. One of the biggest changes is a cap on the state and local tax deduction. Previously, taxpayers could deduct any income, real estate, or personal property taxes paid to their state, county or city. This deduction will now be capped at $10,000 per year. In previous years, we may have advised clients to change the timing of these payments to maximize the deduction between years. However, if you are above the $10,000 limitation, this strategy may no longer be relevant. Note that this limitation does not apply to real estate taxes paid by a business or on a rental property, as those deductions are not categorized as an “itemized deduction”. Medical deductions are still allowable if you itemize deductions and your unreimbursed medical expenses exceed 7.5% of your adjusted gross income. This floor will increase back to 10% in 2019. In addition, the mortgage interest deduction survived the tax law changes, although new mortgages originated after December 15, 2017 will now be limited to interest paid on $750,000 or less of acquisition debt. Note this also applies to mortgages that are refinanced after December 15, 2017. During 2018, we have done a significant amount of planning with our clients around charitable giving. With the increase in the standard deduction and changes to other itemized deductions, many of our clients may find that their traditional giving strategies are no longer as advantageous. One way to combat this is to bunch or increase charitable contributions in alternating years. This bunching strategy may be accomplished by direct gifts to charities or through the use of donor advised funds. A donor advised fund allows a taxpayer to take advantage of the tax deduction in the current year, while payouts from the fund can be deferred until a later date. Clients over the age of 70 ½ may have required minimum distributions to take from their retirement accounts. For those clients, we may recommend considering a qualified charitable distribution (QCD). Such distributions are made directly to charity from your IRA and the amount of the contribution is neither included in your gross income nor deductible as an itemized deduction. The amount of the QCD reduces the taxable income from your required minimum distribution. In response to the cap on state and local tax deductions, many states have attempted to side-step the limitation by creating charitable funds or credit programs. The IRS issued proposed regulations in August to counteract these efforts. As currently drafted, the regulations could impact the deductibility of charitable gifts to organizations who provide their donors with state tax credits such as Neighborhood Assistance (NAP) credits. The donor would still be entitled to the state tax credit, but instead of receiving a federal charitable deduction for the full gift to charity their federal charitable contribution would be reduced by the value of the state credits received. Many of our clients utilize 529 plans as a strategy to save for college tuition for their children and grandchildren. In previous years those funds could only be used for qualified education expenses incurred for higher education. Under the TCJA, qualified education expenses now include tuition at an elementary or secondary public, private or religious school, subject to a $10,000 annual limit. The Child Tax Credit may be more relevant for more taxpayers in 2018. The phase out for the $2,000 per child tax credit now begins at $400,000 for married filing jointly filers and $200,000 for all other filers. Tucked away in the TCJA is the creation of Qualified Opportunity Zones (QO Zones). These are low-income communities that meet certain requirements. Investing in QO Zones can result in two major tax breaks: (1) temporary deferral of gain from the sale of property and (2) permanent exclusion of post-acquisition capital gains on the disposition of investments in QO Zones held for ten years. The IRS has issued proposed regulations related to these QO Zones and QO Zone fund vehicles used to invest in the zones. Additional guidance and regulations are expected. During the debate leading up to the passage of the TCJA, there had been discussions about potentially repealing the estate and gift tax system. While this did not occur, the new tax law includes significant changes that will reduce the number of taxable estate and gifts and provide planning opportunities. The new law doubles the lifetime estate and gift tax exemption from $5 million to $10 million, adjusted for inflation. As of 2018, the adjusted amount is $11.18 million per taxpayer and is scheduled to increase to $11.4 million for 2019. For a married couple, this provides shelter of over $22 million from estate and gift taxes. The most commonly used method for tax-free giving is the annual gift tax exclusion, which does not count against the lifetime exemption and for 2018 increased from $14,000 to $15,000. A person is not limited as to the number of donees to whom he or she may make such gifts. Further, because the annual exclusion is applied on a per-donee basis, a person can leverage the exclusion by making gifts to multiple donees (family and non-family). Thus, if an individual makes $15,000 gifts to 10 donees, he or she may exclude $150,000 from gift tax. 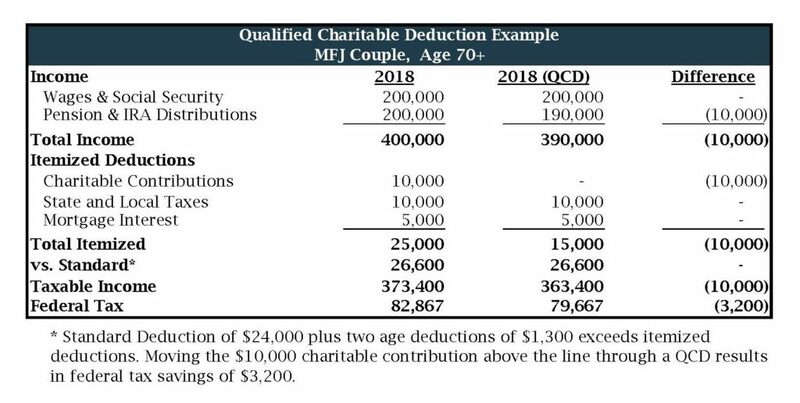 In addition, because spouses may combine their exclusions in a single gift from either spouse, married couples may double the amount of the exclusion to $30,000 per donee. Qualifying tuition payments and medical payments do not count against either the annual exclusion or lifetime exemption limits. It is important to remember that these new rules are scheduled to sunset on December 31, 2025, and there is no guarantee that future legislation will not impact these changes. As a result, we encourage our clients to continue considering gifting strategies in the context of their family’s financial goals and estate plans. One of the hallmarks of the Tax Cuts and Jobs Act was the decrease in the corporate tax rate from 35% to 21%. While this tax rate change was limited to C-Corporations, additional changes were included to benefit pass-through entities such as sole proprietorships, partnerships, and S-Corporations. The pass-through deduction, also referred to as the Qualified Business Income (QBI) deduction or 199A deduction (after the IRS code section) establishes a 20% deduction against taxable income from a qualified trade or business. However, the deduction is subject to various rules and limitations. These limitations exclude wages and guaranteed payment income, exclude certain types of businesses, and impose additional limitations based on income levels. Proposed regulations were released in October which addressed some of the uncertainty surrounding the application of the code section. Additional guidance has been requested to answer lingering questions. Taxpayers should be aware that section 199A could be far reaching. This code section applies to all owners of pass-through entities including owners of investment partnerships, MLPs, and REIT investments. A 199A analysis will need to be done for all taxpayers with these investments. Businesses may also continue to benefit from strategies that defer income and accelerate expenses. Businesses can claim a 100% bonus first-year depreciation deduction for machinery and equipment if purchased and placed in service this year. As a result of the new tax laws, we have spent considerable time this year evaluating business structures for many of our clients. While much of 2018 has been spent absorbing the changes brought by the Tax Cuts and Jobs Act, it is important to continue looking forward for additional changes and opportunities on the horizon. Although some governmental departments have seen a reduction in the number of regulations issued, the IRS and Treasury Department have been flooded with a need for additional regulation to clarify the rules with respect to the TCJA. 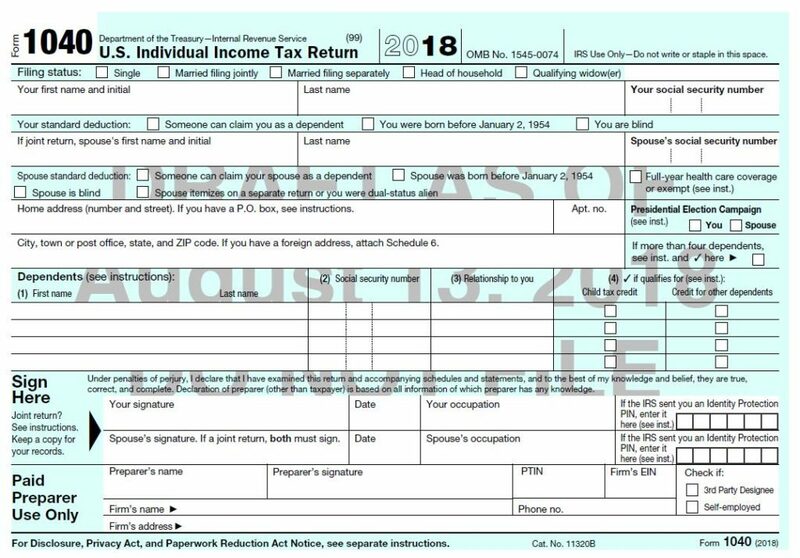 In June, the IRS released a new draft form 1040 income tax return. The new form has shrunk in size with 23 lines compared to 79 on the previous version. However, the complexity of the tax code has certainly not been reduced as evidenced by the six new schedules that were created to accompany the new form. While increasing the standard deduction may decrease the time and cost of compliance for some taxpayers, additional changes including the QBI deduction will likely lead to a significant increase in time and cost of compliance under the new tax legislation. Earlier this year, the IRS estimated the cost of compliance with the rules and regulations regarding pass-through entities may increase by 25 million hours or $1.3 billion across the country. As we mentioned at the beginning of this communication, pro-active tax planning is a year-round effort. This year has definitely been unique given the numerous tax law changes brought by the TCJA. At Heritage Wealth Advisors, we understand that wealth is never about money—it’s about being in a position to do the things that matter most to you. Whether your goal is planning for retirement, providing for your family or giving back to your community, we are committed to helping you define your purpose—then achieve it. If you have any questions regarding the strategies outlined above, please do not hesitate to contact us. This material has been prepared for general informational purposes only and is not intended as a substitute for a formal opinion, nor is it sufficient to avoid tax related penalties. If desired, Heritage Wealth Advisors would be pleased to perform specific research and provide detailed professional advice.